After a couple of days in which I could not knit at all - aaagggghhhh! 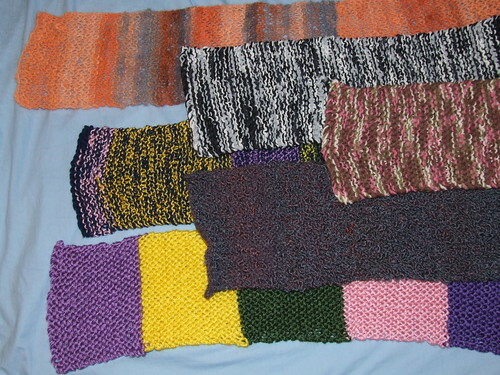 - I have spent the rest of the week recuperating and knitting endless garter stitch scarves. I had promised some scarves to a charity that a friend works for, and they proved to be the exact thing I wanted to knit. There is something so calming about repetitive garter stitch, and it soothed me back to my usual self. I was just finishing the final one on Sunday when I felt myself start to feel positively about casting on my mother's Christmas shawl (I'm making her the same pattern as I used for my Raspberry Ruffles shawl, but in sea-greens and dull yellows - just beautiful yarn!). Euw, hope you're feeling much better now! Love the scarves. Welcome back to the land of the knitting. Your scarves are beautiful. I'm glad to hear you are feeling better and that your garter stitch knitting helped too.